Some recent reviews posted here on musicainformatica, and other conversations were born elsewhere, have prompted me to spend some time to those programs, or utilities, developed for the conversion of audio files. In fact, I realized that as much as it is a fairly simple procedure, on the webnet you can find such a large amount of software that becomes difficult to navigate, especially if you’re looking for something free, and maybe even open source. Besides the gratuity, the most important distinguishing element among the many available software is the number of formats that are able to handle. I state that I do not wish to face a test for all the software around, I took the job to prove someone, noting in this post impressions that I got. I said earlier that the main feature of which is the difference between conversion utility, is the number of supported formats. Clearly it would be very convenient to use a single program that is capable of making us work with any format in circulation. Will it be possible? Among the free software that I found in circulation seems to me that the MediaHuman Audio Converter is the most interesting, with a high degree of satisfaction with simplicity, ease of use, clarity of the interface, lightness and managed formats. For this last speech I will now highlight MHAC that allows conversion between file with WMA, MP3, AAC, WAV, FLAC, OGG, AIFF formats and high quality of the Apple brand. 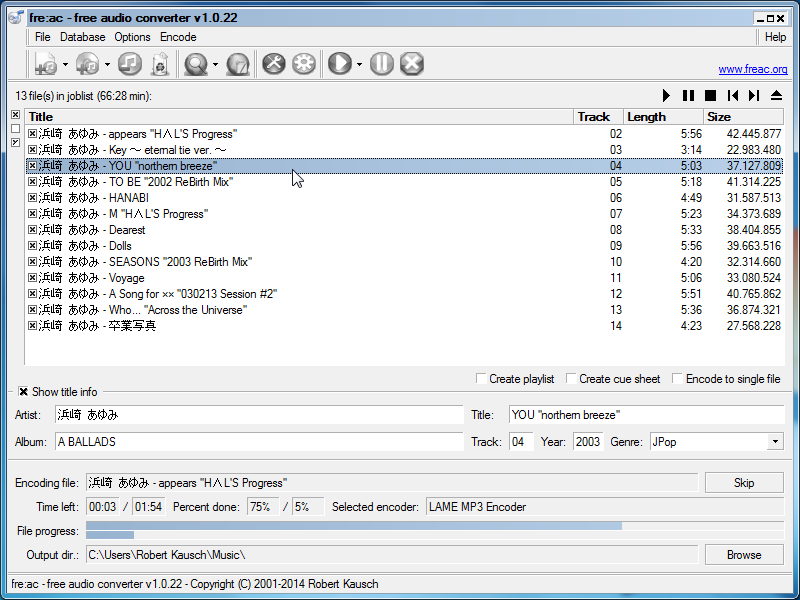 MediaHuman Audio Converter’s interface is basic and highly intuitive. There are six buttons: the first three are used to add a track to convert, or to remove it through the – button, while the middle one is used to clean up all the conversion list. The fourth button is used to select the format you want to convert our files. The penultimate button starts the conversion while the key symbol indicates the settings button, through which also define other options. Among other options worth remembering that allows conversion of formats also .cue, with its subdivision into tracks; comes with support iTunes and allows you to extract audio tracks from video files. To download the software, free and available for two major operating systems, you can follow this link if you are Windows users, or this link if you are Mac users (in the latter case, scroll down to find the words Audio Converter). Although MHAC is a software more than satisfactory for the conversion work, I thought someone else to test for completeness. MI came across Freemake Audio Converter, which presents itself with an extremely intuitive interface, that makes using the program easy. As regards the sizes covers all the most widely used but someone in less than MHAC. However this is not the worst thing Freemake Audio Converter which I promptly hated because during installation must be very careful not to allow installation of the advertising use of a host of other benefits that have nothing to do with the audio conversion. Although I have put great attention to the end I missed something and I found myself with two more software, unwelcome. The interface Freemake Audio Converter. In addition, this software allows you to join together unrelated tracks, activating the option in the upper left. Supported formats are visible with the icons below. If however you are interested in trying it, then this is the link to the official website. Clearly, free, and in this case, also open source. A screen of Fre: ac. Certainly more complex than at the interface of the two previous programs, but at the same time even more complete in terms of functionality and features. To download Free: ac I suggest you follow this link, regardless if you are Windows users, Linux or Mac. And if you’re looking for something even easier because you need a quick and easy conversion to a draft, then you can try a few converter online, without installation or download. There are many in circulation, for this I simply point out that with which I was better, that Media.io, which you can find by following this link. If we stay within the framework of on-line applications, then I would like to point out another utility, which allows the conversion of MIDI files, a format that so far I had not taken into account. If you do not have pretensions then I can recommend Zamzar, which allows you to convert files with the extension .mid in all major audio formats so far mentioned. To try it, follow this link. Remember to select from the menu to the right format in which to convert. I repeat that this article is not going to cover all the vast panorama of the free software and open source available online, but only provide guidance on some of them. Indeed, it would be interesting to hear other opinions on this page, and maybe receive the reports from other users, perhaps commenting on the article.